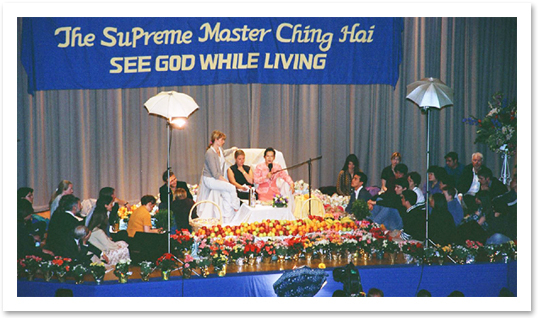 God's Direct contact/Supreme Master Ching Hai /Lecture Tours‧Spreading Peace and Love/European Lecture Tour in 1999/England-U.K.
Master's last lecture in Europe was a tremendous success. Fellow initiates vacated the lecture hall in deference to the guests and sat in two other rooms with large video projection screens. When waves of people poured into the lecture hall, the initiates immediately gave up one room to the guests, which was fully occupied in no time. Finally, the initiates withdrew from the last room. Although they had no seats, their hearts were filled with happiness. Dressed elegantly in pink, Master mounted the platform and invited some of the audience members in front to sit on the platform beside Her. Two lucky young girls sat side by side with Master. 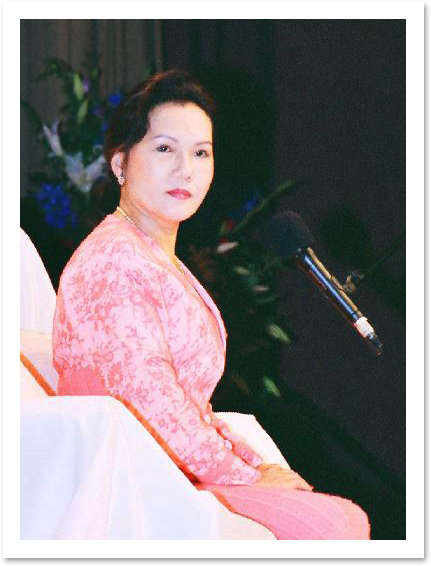 During Master's lecture, She assured us that we can see God in our present lives. In fact, seeing God is not difficult. Even children can communicate with God. During the question and answer period, question sheets streamed up to the platform, including piles of questions from the other two rooms. When Master had answered the questions from all three rooms, the audience continued to ask more, verbally. Even when the lecture was drawing to an end, audience members were reluctant to leave. Then, those in attendance closed their eyes and prayed for a few minutes, and Master gave them blessed food. This finally concluded the lecture period. Next, when Master stepped out of the hall, She greeted the people standing near the stairway. One guest requested initiation even though he was the owner of a non-vegetarian restaurant. Due to his sincerity, Master approved his initiation anyway but advised him to change his restaurant to a vegetarian one. He was so delighted that he repeatedly thanked Her. One Catholic priest and two nuns also attended the lecture and sat in the first row. The humor in Master's answers to the audience members' questions moved all three of them to warm-hearted laughter. Later they received initiation into the Quan Yin Method. Hundreds of people were initiated in London, which had the highest total of new initiates among all the lecture stops. It was a great success to have so many new fellow initiates join us in the capital of the United Kingdom, and the perfect conclusion to Master's 1999 European Lecture Tour!